Michael Bostwick has won four Posh player-of-the-year awards. Michael Bostwick has claimed four Peterborough United player-of-the-year awards. Marcus Maddison is the Junior Posh choice of Posh player of the year. ‘Forever Posh’ is the football club’s official supporters club and they hosted tonight’s presentations. Goalkeeper Luke McGee won the players’ player-of-the-year award, Marcus Maddison won the Junior Posh prize, Leo Da Silva Lopes collected the young player of the year trophy and there was a special presentation to boardroom host Bob Burrows for his outstanding contribution to the club. McGee was runner-up in the ‘Forever Posh’ poll, while Maddison was runner-up in the away travel vote. Bostwick said: “This club feels like home for me. I love the place and I hope I can carry on here. Luke McGee is the Posh players' player-of-the-year. “It’s been a very frustrating season. We were there or thereabouts before Christmas, and we got close at times in the new year, but we couldn’t quite get the results we needed when we needed them. We can’t dwell on it. We need to learn, pick ourselves up and go again next season. “We have a lot to do, but the manager works tirelessly every day and it’s up to us to deliver the performances. 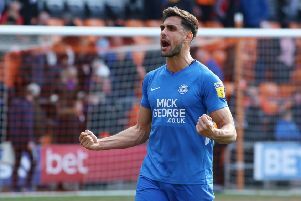 Bostwick is about to enter the final year of his Posh contract.